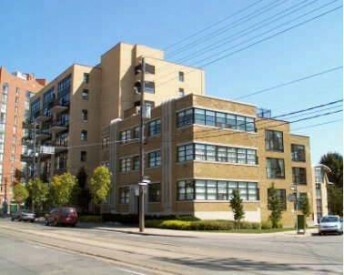 The West 833 Lofts is a former 1930’s 3 level perfume factory located at 833 King St West (King Street West and Niagara). This former factory was converted into a 7 level loft building in 1998 with 52 hard loft units. Suites range from 645 sq ft to 1614 sq ft.
West 833 residents can enjoy the BBQ’s on the roof top terrace which overlooks the park, the party room, rec room, security system and 3 visitor parking spots. The building is pet friendly!